Beginning tomorrow, and continuing each Wednesday through August 10th, Wednesdays will be CAPS Night Out at Buttercup Park. 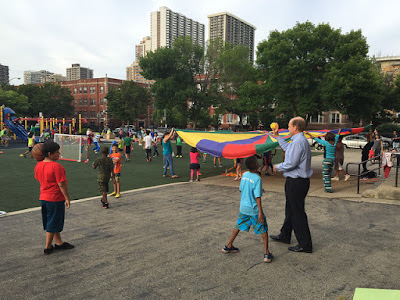 Between 5pm and 7:30pm, 20th District police officers and community members will lead group activities and games with local kids for the next seven Wednesdays. Volunteers are needed to help out! "We are looking for energetic, dedicated and fun volunteers to help with CAPS Night Out at Buttercup Park. Volunteers will help with activities, games, art projects, basketball, yoga, serving food/snacks, set-up, break-down and being present to help activate Buttercup Park each Wednesday night (5-7:30 pm) from June 29-August 10. To volunteer, please send an email to pc@48thward.org."